The Miss India-DC Pageant has hit its milestone 20th year! 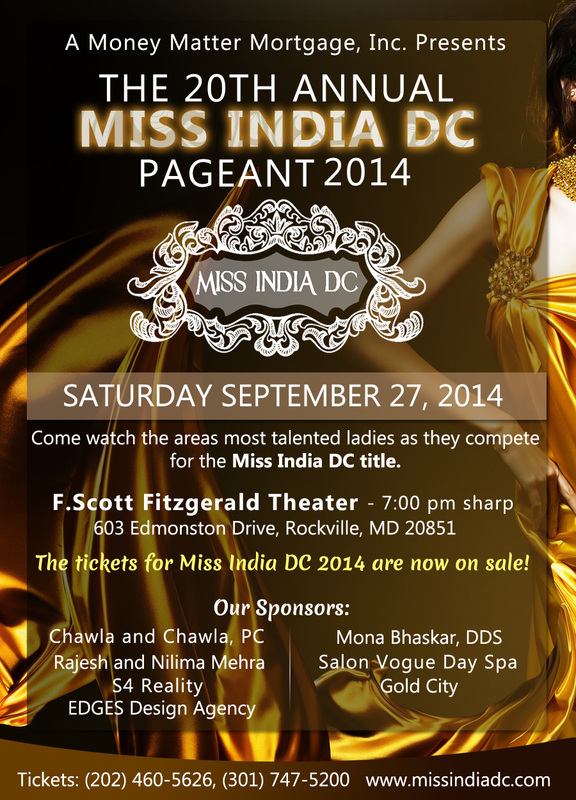 Miss India DC 2014 is taking place on Saturday, September 27, 2014 @ F.Scott Fitzgerald Theater – 7:00 pm sharp. Grab the tickets before they’re sold out! 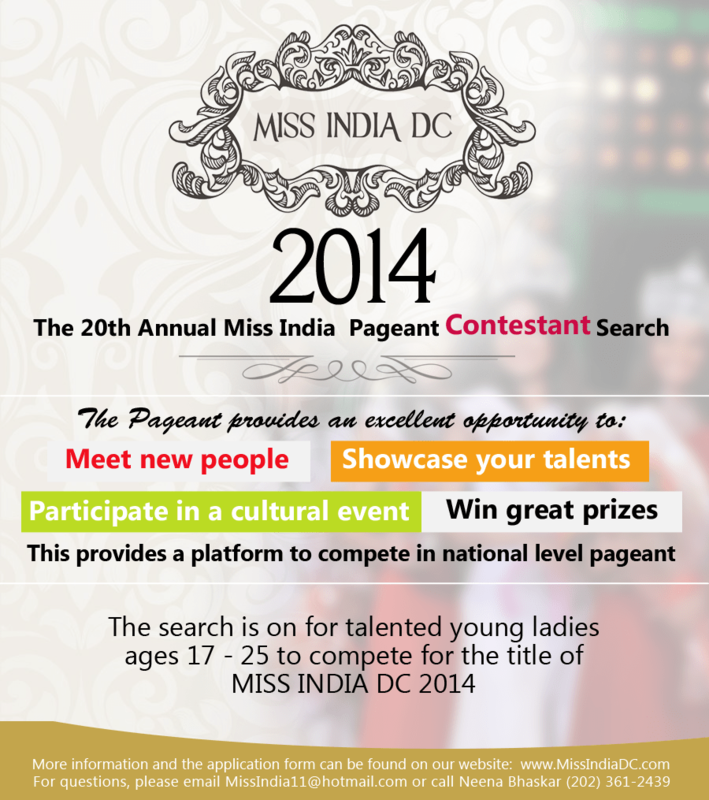 Miss India DC 2014 is going to be bigger and better than before. To start off, we have completely redone our pageant website which not only gives it a completely new & glamorous look but it also contains a lot of new features. Contestants can now register themselves on the website by filling out a form, Each contestant has an interactive profile page which the community can use to get to know the contestants better. There is also a discussion forum in each contestant profile so that supporters can leave feedback and advice for the contestants. The contestants will be given a login id and password and they can also edit their profiles. The contestants can also post blogs on the website by using their login ids. The new website has a lot of images and a videos page. More videos such as contestant intro clips will be added to the website as the contest date nears. The website is also responsive meaning its view-able on every computer, mobile and tablet out there and adopts the data on the website to the respective device. This pageant prides itself on NOT being a conventional beauty pageant, rather, we look for confident, intelligent, and talented young ladies to participate. This pageant provides a platform for these young ladies to showcase their talents, participate in a cultural event, meet people with similar backgrounds, win great prizes, and have the opportunity to compete on a national level. The pageant consists of Indian Dress Competition, Evening Gown Competition, Talent Competition, selection of 5 finalists and a question answer segment. Along with the pageant, there will be many other entertaining items in the show. Thanks to the continued support from the community, we have been able to continue this show. We hope you continue to support us and encourage the local talent of the youths in our community.